Do you remember the old Rivervale Hotel? I recall going there years ago when the exterior looked a little dodgy and a local radio station used to broadcast its 'Sunday Sesh' from there. Wow – now I'm showing my age. 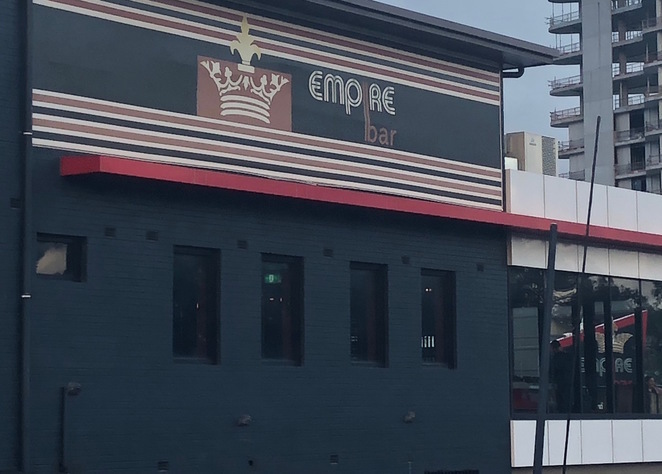 Fast forward a few years and the dodgy exterior and Sunday Sessions are long gone – even the name has changed and it is now known as the Empire Bar. The old Rivervale Hotel has changed a lot over the past few years. To some, it will always known as the Rivervale, but for me there wasn't much evidence to suggest this was the same bar I'd been to all those years ago. 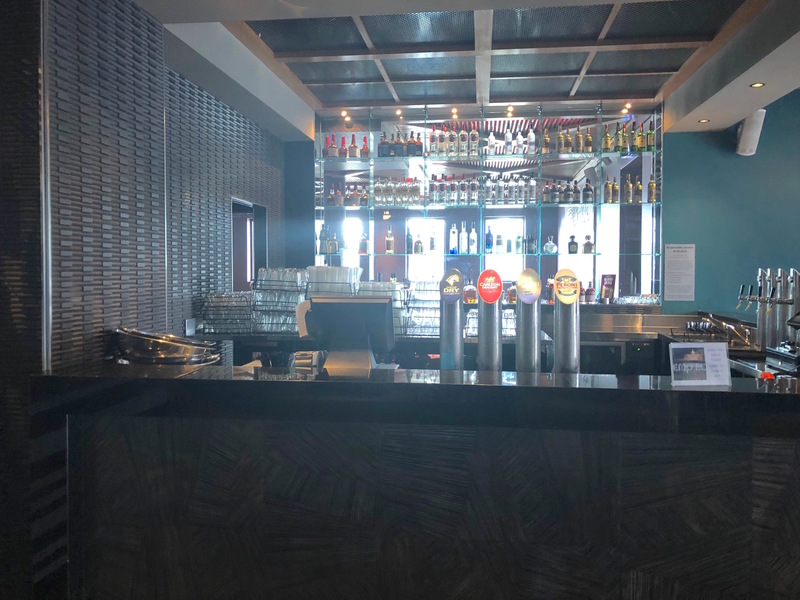 There are several sleek bar areas, a stylish and modern restaurant, a separate wine bar and two lovely beer gardens that would be perfect for enjoying a beer or wine on a sunny day. Just one of the bars at Empire Bar. 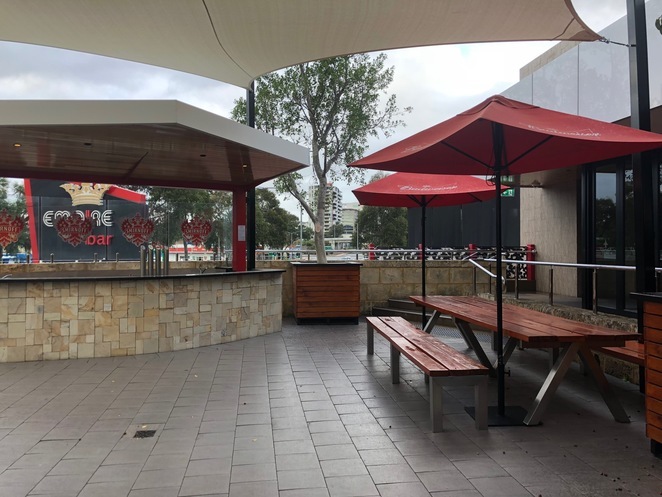 What I do remember is the front beer garden, which is now home to a GIANT TV screen for the footy, cricket, UFC or any other sporting event you may want to watch, plus a table tennis area. There are shaded tables and chairs outside, and this area leads into the bars. The restaurant is great for family dining. My family and I visited on a Sunday for a late lunch with our two children. Meals are available from 11:30am until late, so ordering at 2:30pm wasn't a problem. We sat in the restaurant and were provided with menus and a kids' meal, plus crayons for our little girl. There was also plenty of space in the various bars to sit and enjoy a meal, drink or even a cup of coffee. 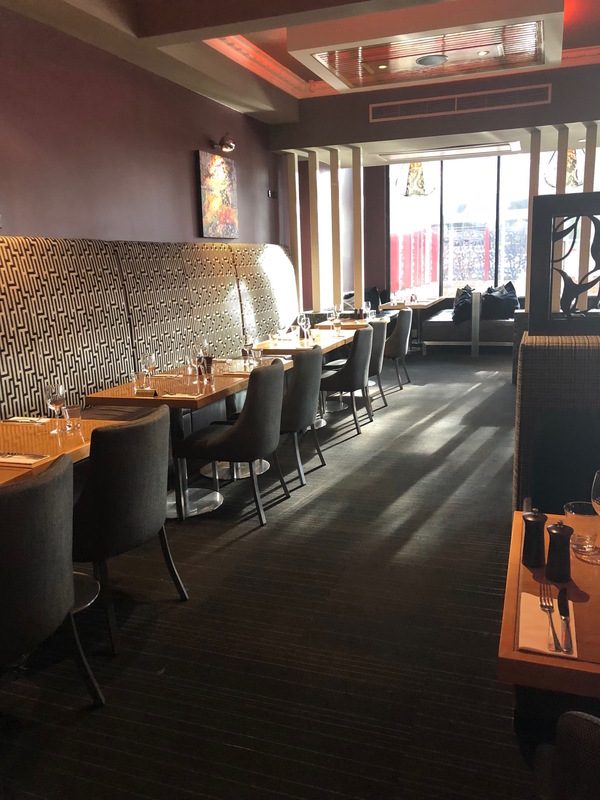 The menu has a range of starters and share plates, including dips and breads, chicken wings and oysters. The mains include Black Angus Sirloin, Goldband snapper, pork belly and a Scotch steak sandwich for $20 on Sundays. If you need gluten free food, you can order a pizza with a gluten free base (for an extra cost) and every effort is made to ensure the gluten free base is prepared well away from the regular pizza bases and other food containing gluten. I chose the $20 Scotch steak sandwich and my husband went for the sirloin and the usual chicken nuggets and chips for the little one. Our meals were served quickly, since it was relatively quiet and we all tucked in. I find a good steak sandwich quite hard to come by, but this was one of the better ones. The steak wasn't chewy like I have found in the past, and the Turkish bread was soft but not soggy, with just the right amount of mustard mayo. 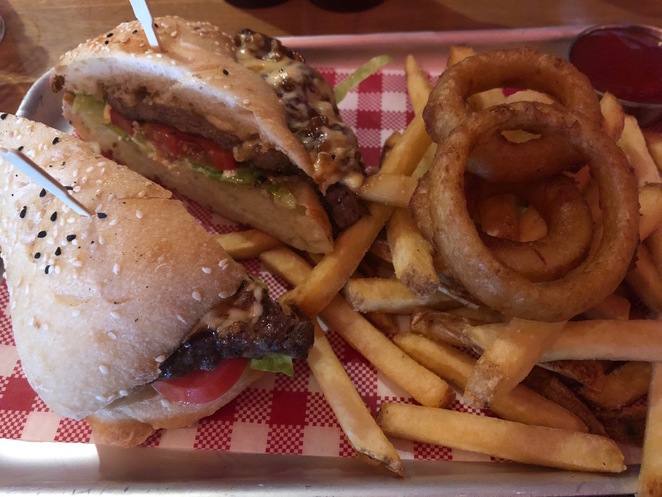 The caramelised onions, tomato and cheddar completed the sandwich and it was served with onion rings – one of my favourites! 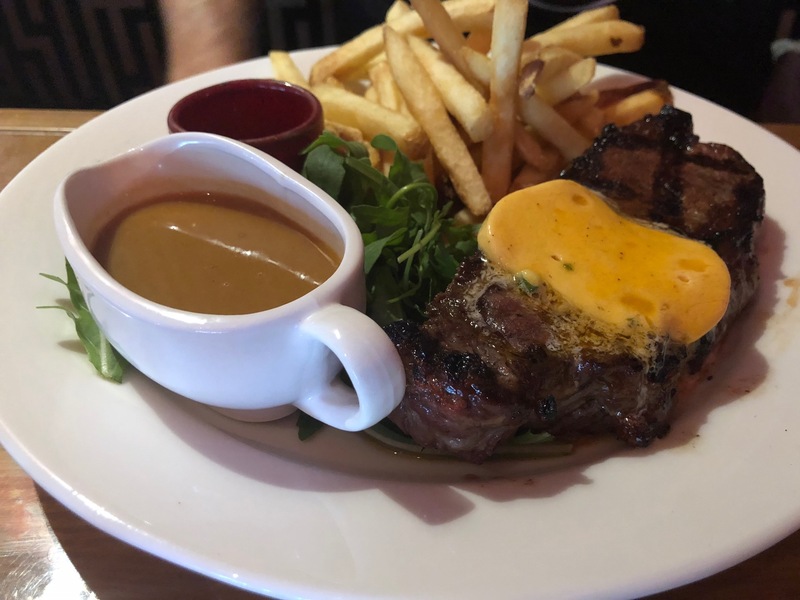 I don't eat steak, so to me the dollop of Umami butter on the top of the steak was a bit unsightly, but apparently it was delicious (I am going to have to go by my husband's comments on this one.) He told me the steak was soft without being chewy and was cooked just the way he liked it – medium rare. The addition of the butter was… different, but it wasn't overpowering in anyway. I think he would've been happy enough with his side of gravy. The kids' nuggets and chips. My little girl doesn't like to sit still for long, so soon after we finished our meal she was up and about and wanted to have a look in the beer garden. Here you will find another HUGE TV screen, along with shaded tables and chairs and another small bar, which wasn't open on the day we went, since it was raining after all. The Empire Bar in Rivervale. Empire has a number of different beers on tap, plus plenty of bottled beers, spirits, wines and cocktails. 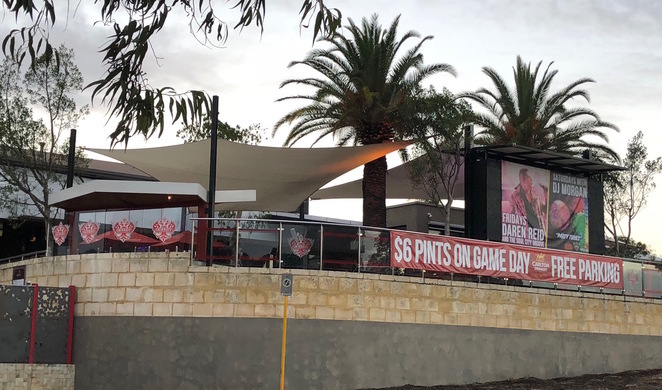 The kitchen is open all day long, and they also have daily specials, along with $6 pints and free parking on AFL game days – the bar is a short walk from Burswood Train Station, making it a handy location if you are planning on going to a game at Optus Stadium, which is only one train station away. 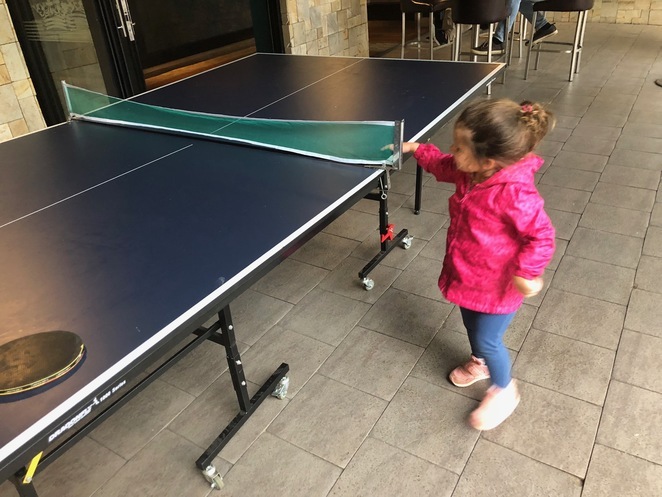 Empire Bar had a bit of something for everyone – family friendly dining, table tennis, sports and a great selection of drinks. It is worth a visit whether you are spending time with family or friends or headed to the footy. 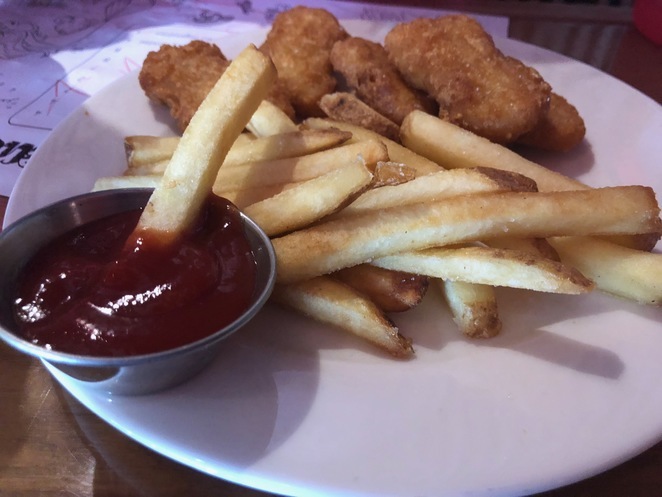 Glad you had a good experience there for lunch, and it might even be worth checking out. But fast forward to night time, and it is not enjoyable at all. The music is WAY too loud, you can't hear a word the person right beside you is saying let alone anyone else in your group, and there is not enough seating. I've been there twice and hated the experience both times. I refuse to go back. Not enjoyable at all. I've been in night clubs that were more enjoyable and not as loud. Plus the drinks are expensive.